Description: Winter skiers float through a fresh 6-plus inches of snow to find their Nirvana. Slalom racers carve aggressively around the tightly placed gates. 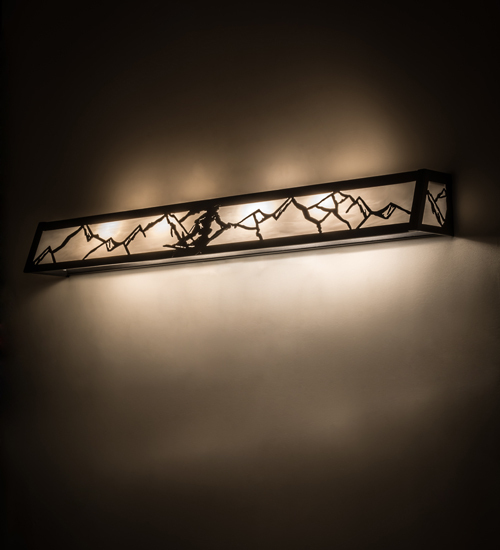 Imagine your chalet adorned with the Alpine themed, made to order line of fixtures. This vanity light features a White art glass diffuser complemented with decorative accents and hardware in a Textured Black finish. Shade colors, metal finishes and artwork profiles can be customized to your preference. Handcrafted in our 180,000 square foot manufacturing facility in Yorkville, New York located at the foothills of the Adirondack Mountains, not far from Lake Placid, home of the 1932 and 1980 Winter Olympics. UL and cUL listed for dry and damp locations.